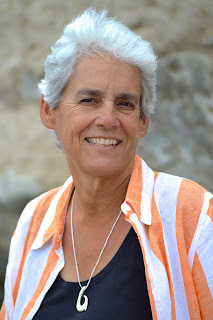 LUCY BURDETTE: I'm delighted to bring Leslie Karst back to the Reds--I loved her first culinary mystery and I'm salivating to read the second. When she chose inauguration day as the date for her post, I had some misgivings...but I love the idea of the country coming together over food. See what you think...and we'd like to hear your suggestions about healing the rifts in our country too! LESLIE KARST: Today is inauguration day and across the country emotions are running high. But they are not merely elevated: Right now—more than at any time since the 1960s—those emotions seem to be at polar opposites, with half the population experiencing euphoric ecstasy, the other half misery and despair. Whether you support our new president or not, one thing that cannot be disputed is that we have become a nation divided. can the hamburger heal our nation’s divide? And this makes me sad. Because I believe that we, as a country, are truly more connected than we are divided. The culture we share runs deep, whether we’re from Macon, Georgia or from San Francisco, California. But largely as a result of this bitter, divisive election we’ve just experienced—and the compounding effects of social, print, and televised media—we have come out of the event focused on our differences, rather than our similarities. I’ve therefore been pondering the question, what can we do to heal this division? How do we encourage one another to instead focus once more on those customs and traditions which connect us, unite us, as Americans? Let me mention here that mystery readers and writers seem to be one group of people who, though we run the gamut of the political spectrum, are nevertheless united by our love of crimes, clues, clever sleuths, and the spinning of a good yarn. And this sense of solidarity across party lines is one of the things I love most about our community. But for the rest of the country, how can we heal this rift? Well, I write culinary cozy mysteries, so my thoughts are never far from food and cooking. Not surprisingly, then, it came to me that what we eat connects us as a nation, perhaps more than any other activity. San Franciscans adore southern barbecue and Georgians love sourdough bread. And Americans across the country—no matter our race, religion, political party, sexual orientation, or cultural background—sit down together each Thanksgiving to share turkey, stuffing, mashed potatoes, gravy, green beans, and pumpkin pie. It has long been my belief that coming together at mealtimes to sip some wine, swap stories, and learn what’s been going on in each others’ lives, is an essential part of what it is that makes us human. From the time of the stone age, early Homo Sapiens would gather about the communal fire each night for safety, stories, and food. And although this now often takes the form of a pizza night in front of the TV, we still find comfort in our shared breaking of bread. So here’s my idea: Form an online group (such as a community Facebook page) called “COME TO THE TABLE: RECIPES FOR A MORE PERFECT UNION.” Readers would submit stories, photos, and recipes demonstrating how much we share as a nation, and recounting incidents or events when people of different cultures have come together and were united by food, drink, or cooking. It’s my hope that in this way, not only would folks get to read some uplifting stories online about unity as opposed to divisiveness, but the page would also bring together people of divergent cultures and beliefs. An example: The time my wife, Robin, and I spent the evening in a Navajo bar in some tiny town in New Mexico. We were the only women and only white people in the bar and got some pretty strange looks when we walked in, but it was the only place around where we could watch the World Series. After a few minutes we went next door to McDonalds and brought a Big Mac back for the bartender. Almost immediately the tension in the bar dissipated and all the patrons wanted to come chat us up. It ended up being one of the most fun nights I’ve ever had. So what do you readers think of the idea? Would you participate in an online forum or Facebook page like this? Please comment below to let me know! Leslie and her publisher are offering a copy of A MEASURE OF MURDER to one lucky commenter today--don't forget to leave your email! Sally Solari is busy juggling work at her family’s Italian restaurant, Solari’s, and helping plan the autumn menu for the restaurant she’s just inherited, Gauguin. Complicating this already hectic schedule, Sally joins her ex-boyfriend Eric’s chorus, which is performing a newly discovered version of her favorite composition: the Mozart Requiem. But then, at the first rehearsal, a tenor falls to his death on the church courtyard—and his soprano girlfriend is sure it wasn’t an accident. Now Sally's back on another murder case mixed in with a dash of revenge, a pinch of peril, and a suspicious stack of sheet music. And while tensions in the chorus heat up, so does the kitchen at Gauguin, set aflame right as Sally starts getting too close to the truth. Can Sally catch the killer before she’s burnt to a crisp, or will the case grow as cold as yesterday’s leftovers? 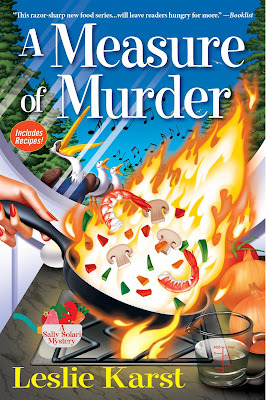 Leslie Karst is the author of the Sally Solari culinary mystery series, published by Crooked Lane Books (Dying for a Taste, A Measure of Murder). The daughter of a law professor and a potter, Leslie has degrees in English literature, law, and culinary arts. After graduating from Stanford Law School, she worked for twenty years as a research and appellate attorney before turning to mystery writing. Leslie now spends her days cooking, gardening, cycling, singing alto in the local community chorus, and of course writing. She and her wife and their Jack Russell mix, Ziggy, split their time between Santa Cruz, California and Hilo, Hawai’i. Visit her online at http://www.lesliekarstauthor.com/ and at https://www.facebook.com/lesliekarstauthor/ . Leslie, I’m looking forward to reading “A Measure of Murder” . . . . I wish I had the answer, the magic wand, the whatever-it-is that we need to heal the divisiveness in our country. But I don’t and as saddened as I am by the discord, this is how democracy works. Is there any other place where a nation’s citizenry could protest and criticize so freely? Social media is doing its part to support the division; using it to encourage each other and to focus on all that is right with this nation and its traditions is a stupendous idea . . . . Brilliant idea! I can't organize it, either, naturally, but I would absolutely participate. And I can't wait for the second Sally Solari book - I loved the first one, as you know. (Leslie and I met when we agree, sight unseen, to share a room at Left Coast Crime in Monterey a few years ago, and we totally hit it off.) Congratulations on the series continuing. Leslie, so nice to hear such sensible thoughts in a time that's so infused by chaos and anger. It would be nice to think that food can build bridges. Food and drink is a great uniter. I don't think it is a coincidence that so many of our gatherings as people involve either or both. Edith, curry in maple biscuits? Hmm. I'd have to try that one. Sadly, I don't have enough time to maintain such an online community, but it would be a great idea. I think we're going to find we need each other in the four years to come. Welcome Leslie, and bonne chance with the new book. I look forward to sampling your wares. As for the forum, I think it is a splendid idea. I lived on the Navajo reservation in the late seventies, early eighties. Did I ever learn what it was like to be a minority although I already tick quite a few boxes to begin with. I have lots of thoughts of white privilege but won't go into them here. If you find a kind soul to moderate and manage this, I'd be honored to participate. I do make a mean Navajo taco however. My family has adopted the Danish idea of "hygge" (HOO-guh): eating comforting food in front of a cozy fire, listening to music we love, reading, and wearing knit socks. (From what I understand, knit socks are a big part of hygge.) We've found it ever so much more relaxing than talking politics (which we do a lot) or going over the day's news. Of course, the comfort feed we enjoy reflects America's diversity: chile con carne, baked beans, Thai squash soup, lasagna, sauerbraten... united, we eat! I love that idea. And I completely agree, food does bring us together. When I've been traveling in the south for work, I make a point of going to BBQ restaurants because we don't have that kind of good BBQ here in Southern CA. Although yams can be tricky. My family has two yam dishes every year at Thanksgiving - my family's and my sister-in-law's family's. After the first couple of years, we all look forward to both dishes because they are both good. Leslie - I think that's brilliant. Food is a commonality that can bring people together - especially if they share a good recipe. to a group like that! I loved your first book, as you know, and I am really looking forward to the latest installment. Oh,this is the best idea. Thank you. It is perfect. Let us all raise a virtual glass (and maybe some virtual mac and cheese) to love and peace and good socks. It's going to be HYGGE. It is remarkable, and monumentally sad, that we have painted ourselves into this "us" vs :them" corner. Anything that will help us all remember how much we have in common is to be encouraged. Congrats on a "Measure of Murder," Leslie. Just reading about it is making me hungry! Cheers to you for posting on inauguration day; all of us will need to become more active citizens as we move into this next chapter. Ann, What exactly is a Navaho taco? Curry maple biscuits, Navajo tacos, hygge, yams, mac 'n cheese--what a wonderful country we live in! It's not even 8:30 a.m. yet here in Hawai'i and I'm already ready for lunch! Hi Leslie! So looking forward to A Measure of Murder! And I think an online "united by food" community is a great idea, if only we could find someone to oversee it. (The Solmate socks.) In fact, I think I need some new ones, and I just saw them on Amazon for a LOT less. A gathering with food plays right to my sweet spot. It creates an atmosphere of relaxation, better moods, and deep soul satisfaction. I guess that's why I enjoy going out to eat with friends so much. And, I want to linger when I eat, not rush through just to satisfy my physical needs. I am the slowest eater in my husband's family, but I credit it to growing up in a family where food was such a comforting source of gathering. It's an experience in being with those you care about every bit as much as eating. Julia, I love the hygge idea. No wonder your family is so close and loving. Thanks for the sock site, Debs. Leslie, A Measure of Murder sounds, well, delicious. I definitely want to get on board with this series. One of the things I so enjoyed about Lucy's Key West mysteries was the food from a place I love to visit. The food forum sounds like a great idea, and I would love to participate in one. It sounds interesting. An online forum would be harder to moderate, but more accessible to those of us who don't "do" Facebook, though. Tried to remember why the name Leslie Karst was familiar. Then I read the rest of today's post and realized I just recently read-and enjoyed- your first book. So glad to know there's another one! I rarely have time for Facebook anymore so I don't know if I would participate in the kind of forum you mentioned but I might occasionally stop off and read any recipes shared! Deb Crombie, thanks to you, the owner of a local gift shop lets me know whenever she has a new shipment of Solmate socks! I might be her most loyal sock customer! Leslie, I love your idea!! And your post. And your books. And you. Coming late to the party but love the idea!